It’s been said that the best way to build an innovative business is to take two seemingly unrelated ideas and combine them together. If you do that, you may have plenty of competitors who focus on either one of those ideas, you become the de facto expert of the intersection of both of them. Waffle Irons were originally designed to make…. well… waffles…. But when Nike Co-Founder Bill Bowerman decided to use one to melt a pattern into the soles of his wife’s shoes, he changed the running world forever. GPS was originally designed for military intelligence during the cold war. But the founders of Garmin came up with a game changing idea when they decided to use it for outdoor fitness and navigation applications. Love ’em or hate ’em (and I know plenty of people who have pretty strong feelings both ways), the reason Competitor Group has grown into a behemoth in the racing world is because through their Rock n Roll Marathon series they were able to successfully combine the experiences of running a marathon and going to a rock concert. This brings me to a fairly young company called Vacation Races. Since its inaugural half marathon in Zion Canyon in 2012, Vacation Races has been quietly amassing a dedicated group of fans who love the way the company is able to combine road races with exploration of some of the most beautiful places in the world. I’m not kidding about the dedicated part. Runners always like to talk about their favorite races, but with the possible exception of Disney, it’s rare to hear anyone talk about the companies that organize them. 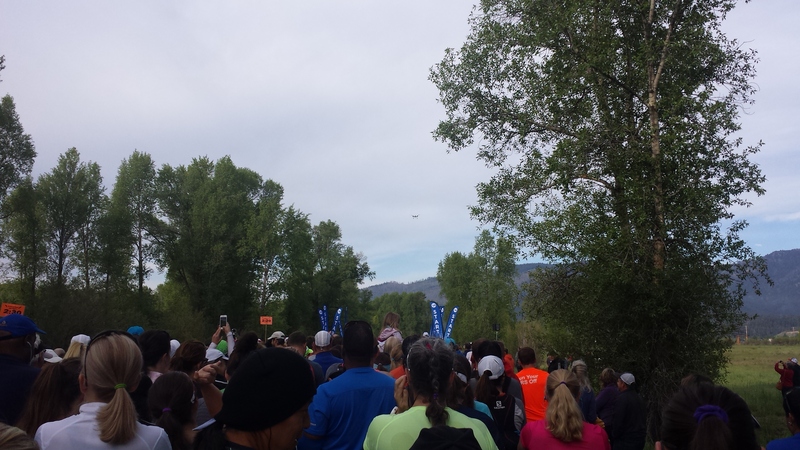 But while I was standing at the start line of the Grand Teton Half Marathon last weekend, I overheard more people talking about how much they love Vacation Races than I’ve ever heard about any other race organizers. The company is also extremely environmentally conscious, very runner-friendly, and very supportive of the US National Parks. Their races are cup free. Their races are gear check bag free. Their races include special challenges where runners who send in pictures of themselves hiking to designated areas after finishing a race can get discounts on future races. They have the best refund / transfer / deferral policy that I’ve ever seen. Runners who sign up for a Vacation Races event but then find out they can’t make it can easily transfer their registration to another runner, defer it for any other Vacation Races event within the next 12 months, or receive a full refund. 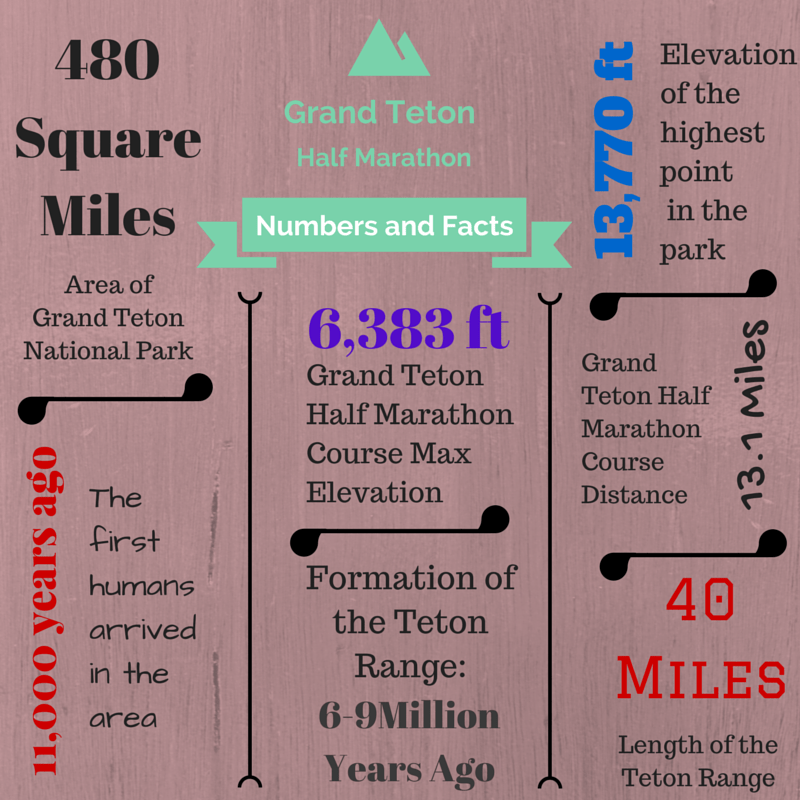 2015 was the first year for the Grand Teton Half Marathon and other than a minor hiccup related to some shuttle buses getting held up in traffic after the race (not the fault of the race organizers), things seemed to go off without a hitch. For anyone not familiar with Grand Teton National Park, it’s a United States National Park that’s located in Northwestern Wyoming, about 10 miles South of Yellowstone National Park. It includes the Teton Range, which is the youngest range of the Rocky Mountains and parts of the valley known as Jackson Hole. 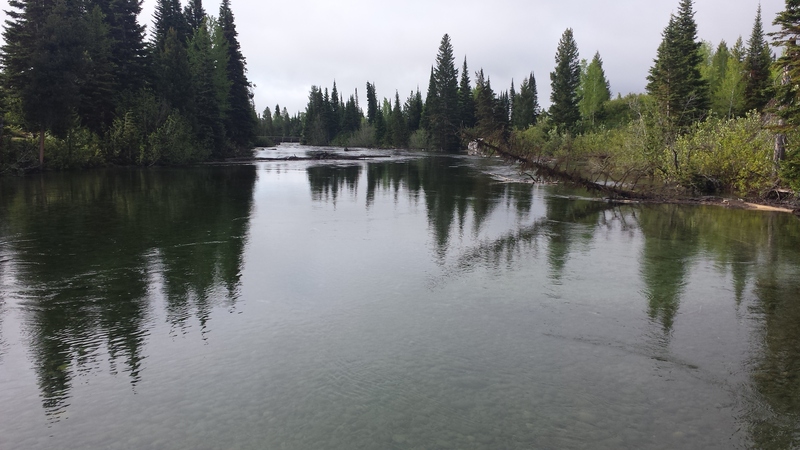 Grand Teton National Park, Yellowstone, and a number of surrounding National Forests make up one of the largest intact mid-latitude temperate ecosystems in the world. Many of the species of plants and animals that existed in the area during prehistoric times can still be found there today. I honestly can’t think of a better place to run a half marathon. Hike to the top of table mountain (12 miles / 8 hours round trip) and send in a picture of yourself and your race bib and medal at the top and you’ll get 50% off of the next year’s race entry. Hike to Amphitheater Lake (10 miles round trip) and send a picture of yourself there to get 50% off of the next year’s race entry. Take the Jenny Lake Shuttle Boat across the lake to Cascade Canyon, hike to the Snake River Overlook, take the Jackson Hole Tram to Rendezvous Point and send in a picture of yourself in all three places and you’ll get 20% off of the next year’s race entry. Runners who arrive on Friday can pick up their packets at the race expo, which is at the Jackson Hole Golf and Tennis Club. Vacation Races also offers race day packet pickup for anyone who isn’t able to make it to the expo. This is a good thing because depending on where you’re coming from, Jackson Hole might not be the easiest place to travel to (more on that in a little bit). Pick up a free hydrapouch when you get your bib and t-shirt at the race expo. A hydrapouch is a small collapsible plastic container that’s roughly the size of a water cup. It has a clip that you can use to attach it to your hip, but I honestly thought it was easier to just carry mine with me. Regardless of whether you use a hydrapouch or bring your own water bottle, the water tables on the course all have coolers full of water with spouts on the bottom. If you need to stop for a drink, you simply go to one of the coolers, fill up your container, drink, and head back out. This sounds like it would be cumbersome or take a long time, but it really doesn’t take any longer than it takes to stop at a regular water table at any other race. There were enough coolers at each water table that I never had to stand in line. In a lot of ways I like this method better than grabbing a cup. You hold onto your hydrapouch after you finish drinking so you really don’t feel the need to drink all the water right away. Another note about the expo is that gear check bags are not freely handed out like they are at other races. This is another way to reduce waste. Runners can bring their own gear check bags, or they can also purchase a bag at the expo if they really need one. I love this because I recently threw out a pile of old gear check bags that were sitting in my closet for years. I don’t need any more bags. The race starts at 8am on Saturday morning and depending on where you’re staying, there are a few options for how to get there. I stayed in downtown Jackson Hole, so I was able to walk to the Recreation Center and take a shuttle bus to the start line. People can also park at the start line if they want, or they can park nearby in Teton Village and take a shuttle. The only downside to taking the shuttle is that the last one leaves at 6:15am so you’ll have to plan to get up a little early. It was still easier than driving though. Since shuttle riders get to the start line so early, the race organizers have raffles while everyone is waiting for the race to start. Raffles are free (there’s a ticket attached to your race bib) and the prizes are all really good. They range from running gear to free race photos all the way up to a free entry to a future race. There are also plenty of restrooms, snacks and a warming tent at the start line. 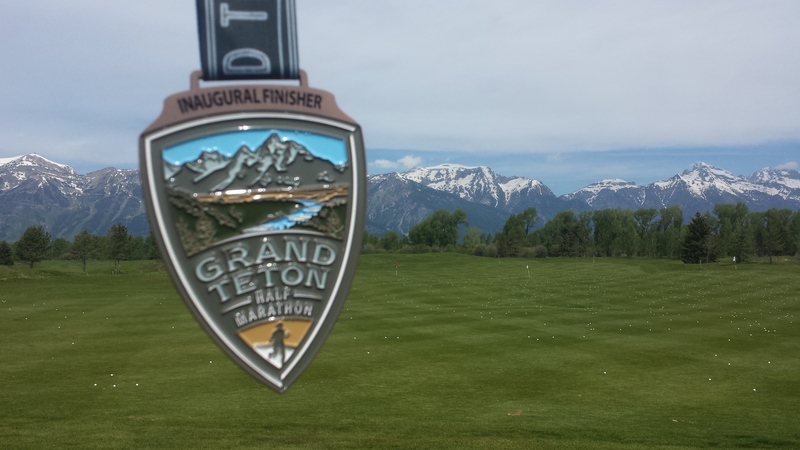 The Grand Teton Half Marathon course starts at Beckley Park Bay, does a small loop through the town of Wilson, WY and then heads over the snake river and up through the mountains towards the National Park. The views are breathtaking. The course finishes in front of the Jackson Hole Golf and Tennis Club. This is not the easiest course I’ve ever done, but it’s also not the most difficult either (Wheeling West Virginia holds that honor). There’s a gradual incline that starts around mile six and continues for most of the rest of the course. I wouldn’t really call this a “hilly” course though because there’s not a lot of up and down and at some points the inclines are barely noticeable. There’s also only a 583 foot elevation gain between the start and finish lines. What makes this course tough is the elevation. 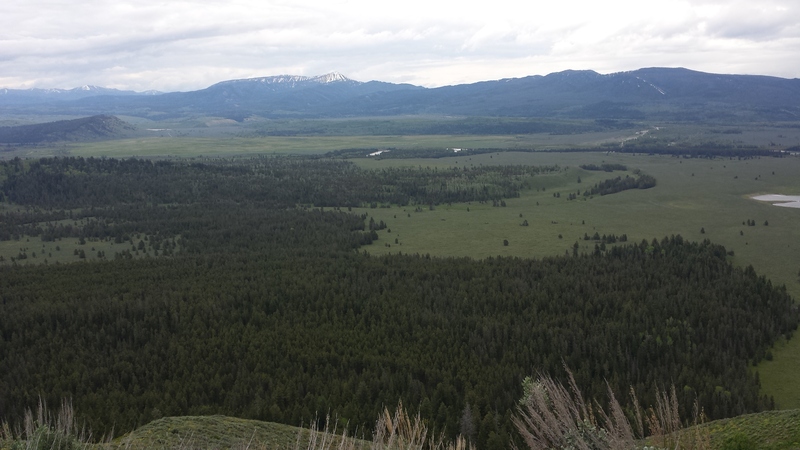 At just over 6000 feet, this was the highest altitude I’ve ever run at. The two closest races I’ve done were Sedona, AZ, which is about 4500 feet and Zion Canyon, which is about 5000. I just did the Zion Canyon half a few months ago and the altitude didn’t seem to affect me in that race as much as it did in this one. I didn’t realize how much thinner the air would be a thousand feet higher up (when you live in Chicago, you really don’t think about these things). Altitude aside though, this was a beautiful course. There was never a time when I wasn’t looking at mountains, rivers or valleys. In fact the course scenery helped to take my mind off of how challenging the run was. By about mile 10, I started to feel like I was running out of gas but one look up at the Teton Range was all the inspiration I needed to keep going. There’s not a lot of crowd support during this race, but honestly a course like this is better without it. There are a lot of spectators at the beginning and end of the race because a shuttle bus drives back and forth between the start and finish lines continuously. There aren’t as many people watching along the course, but that contributes to the overall atmosphere. Big crowds are fine for big city races, but when you’re looking up at a mountain range during your run, there’s nothing better than having the opportunity to be alone with nature. I really can’t say enough about how much I enjoyed this race. All of Vacation Races finisher’s medals are really nice and this one is no different. They’re large, heavy, and in the shape of a national park logo with the name of the race and a picture of one of the main sights from the national park that it’s associated with. 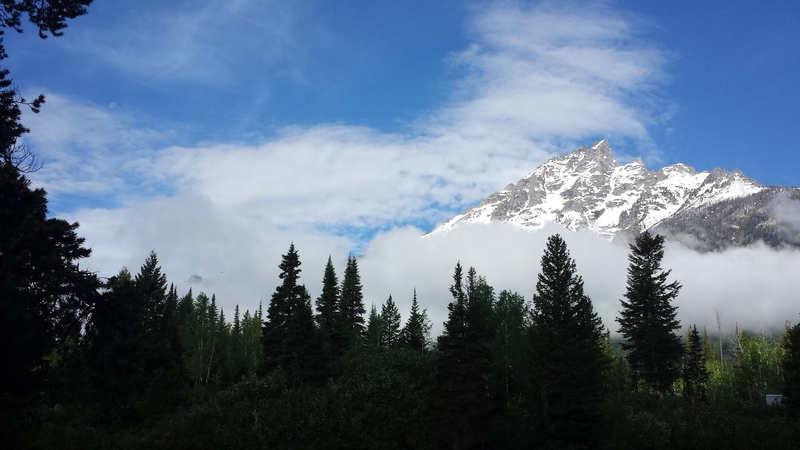 This one had a picture of the Teton Range. If you’re planning to travel to Jackson Hole for this race, you’ll have a couple options. There is a local airport that you can fly into called the Jackson Hole Airport. The interesting thing about this airport is that it’s the only one that’s completely located inside of a National Park. Planes literally land right at the base of the Teton Mountain Range so it’s definitely a cool place to fly into. The downside to flying in is that there are a very limited number of flights and airlines that fly into Jackson Hole. Unless you’re flying in from a major city (Chicago, Denver, etc…), you’ll most likely have a layover somewhere. Flights are also expensive. The cheapest round trip flight from Chicago to Jackson Hole that I could find was close to $800. Your other option is to fly into Salt Lake City, Utah, which is the closest major city. This was what I decided to do and my flight into Salt Lake City was over $500 cheaper than it would have cost me to fly directly into Jackson Hole. I also had plenty of options for flight times. The only “downside” is that Salt Lake City is about a 4 1/2 hour drive from Jackson Hole. I use the word downside lightly though because even though it’s a long drive, it’s also a beautiful drive that takes you North through Utah, into Idaho, and then into Wyoming. Along the way you pass by the Great Salt Lake and drive through two National Forests (Caribou National Forest and Targhee National Forest). I was happy that I decided to fly into Salt Lake City. My flight home wasn’t until later in the evening, so I was able to take my time getting back to the airport and stop at some of those places. 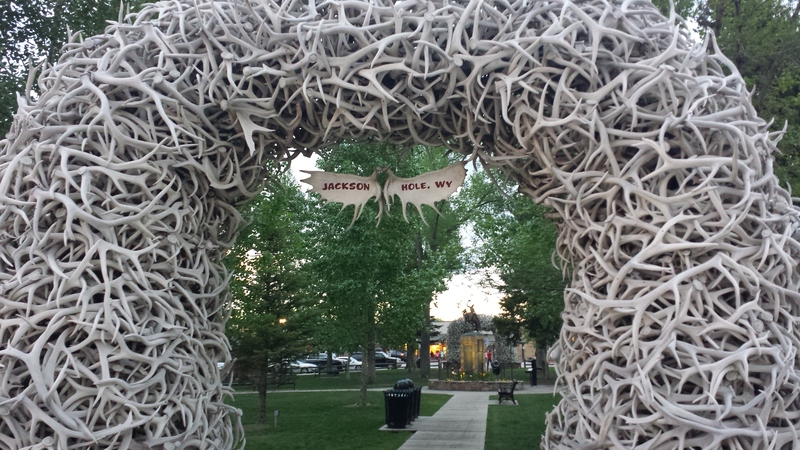 There are a lot of hotels around Jackson Hole. They’re also very expensive. The cheapest hotel I could find was $150 per night and it was a one star hotel that I had never heard of. I met up with my friend Michelle at the race and she and her husband paid $230 per night for their hotel room at the Snake River Inn. They said that it was a good hotel, but if you’re traveling on a budget, my recommendation is to check out Airbnb. There are a ton of really nice houses in Jackson Hole and in a lot of cases their owners are happy to rent them out for a weekend. I was able to get the entire bottom floor of a split level house that was less than a 5 minute walk away from one of the race day shuttle stops for $70 per night. I had such a great experience that I’m going to write a separate post specifically to talk about all the things I loved about Airbnb after I finish this one so stay tuned for some more details in a couple days…. There’s plenty to do on race weekend. 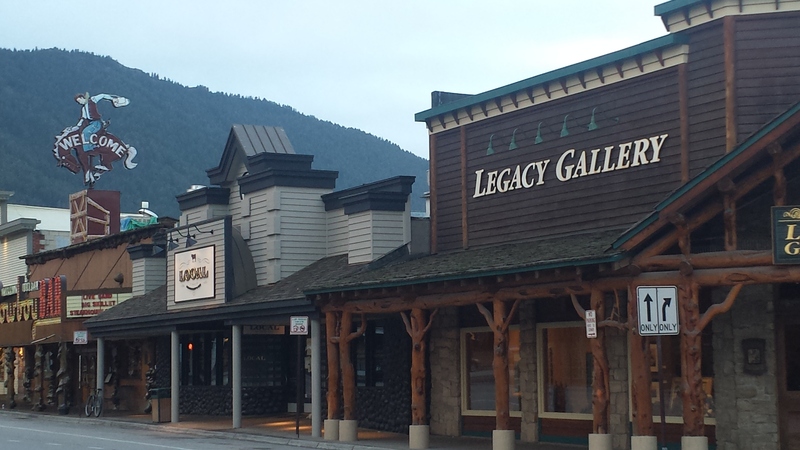 Jackson Hole itself is a modernized frontier town that has some great shops and restaurants. You’ll find a lot of art galleries and craft shops around town and you’ll also have the opportunity to learn a little bit about Wyoming History or have a drink at one of the local bars. 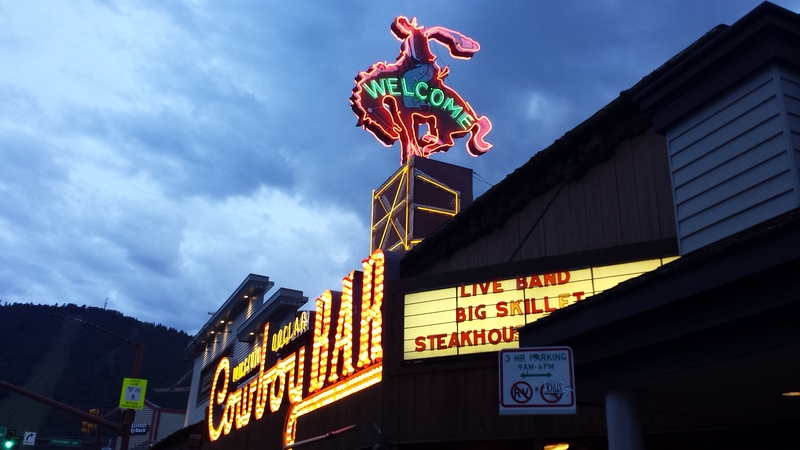 If you’re looking for places to eat, the Wort Hotel is a historical hotel in downtown Jackson Hole and its Silver Dollar Saloon restaurant has excellent food and live music. Down the street is the Snake River Brew Pub, which has some tasty award winning locally brewed beer and delicious buffalo burgers. The Snake River Grill is also in downtown Jackson Hole and is an upscale restaurant that serves what many people consider to be among the best meals in the country. 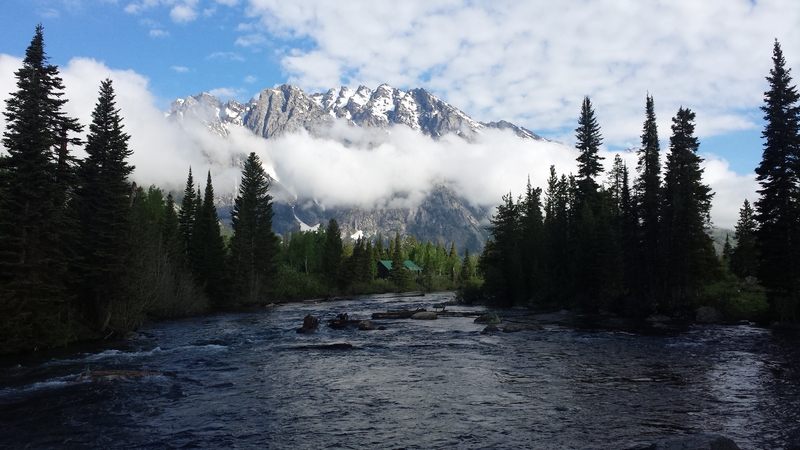 All that said though, the biggest reason to go to Jackson Hole is to visit Grand Teton National Park. From Jenny Lake at the base of Cascade Canyon to the Snake River Overlook to Rendezvous Point, you’ll lose count of the number of sights that take your breath away. You can buy a 7 day pass to the park for $30 per car. This is nice if you have a group of people with you since it’s still only $30. If you’re planning on doing more than two Vacation Races events within a year of each other, I would recommend buying the $80 pass that gets you into any National Park anytime for a year. The main road that goes through the park is about 50 miles long and there are a number of places to pull off if you want to stop and take pictures. There are also some side roads where you can go on short scenic drives and miles of trails to hike on. If you look around, you also might see deer, elk, moose, buffalo, mountain goats, bears (be careful) and a variety of other animals. My only regret about this race was that I didn’t sign up for the Grizzly Double challenge. 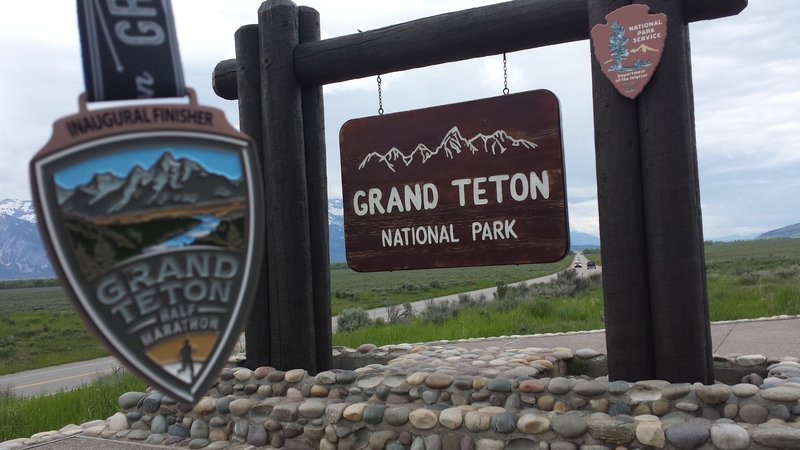 Vacation Races has another half Marathon in Yellowstone National Park the following week and any runner who does both gets a third medal… but they also get a chance to spend an extra week checking out both parks. 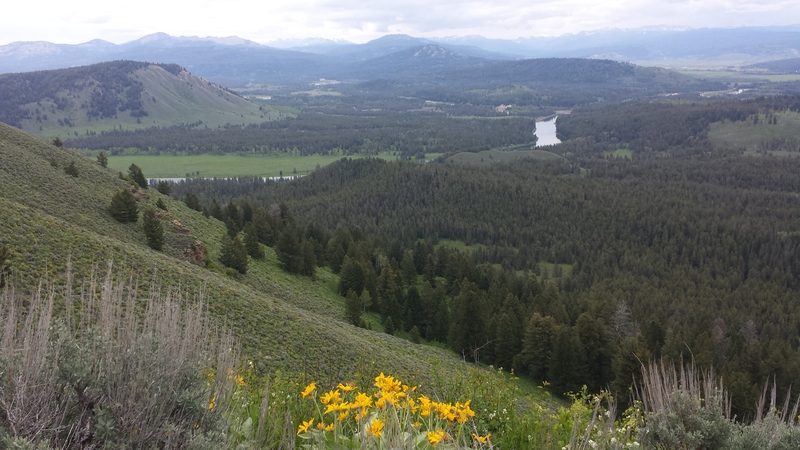 The south entrance to Yellowstone is less than 10 miles away from the north exit of Grand Teton National Park. 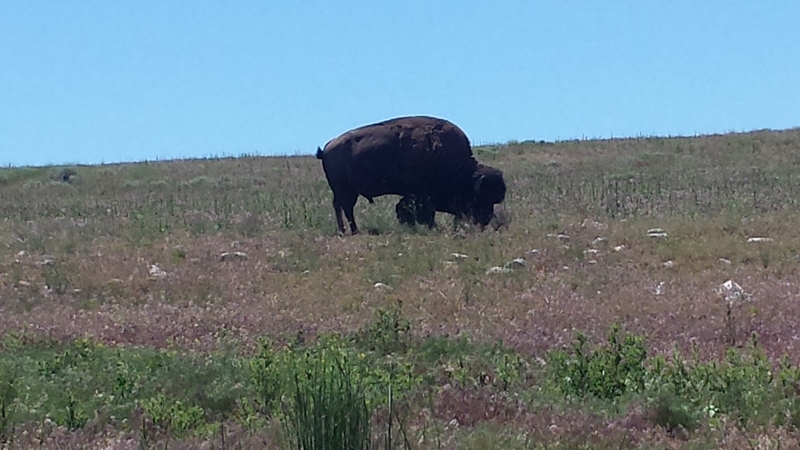 I could have easily spent another week checking out the area. So now I have a good excuse to go back again in the future. Thank you for the fantastic recap! My husband and I honeymooned in the Tetons 35 years ago and want to go back. Registration for 2018 hasn’t opened, but I’ve added my name to their notification list! Awesome! Sorry for the late reply – I’ve been swamped for a few months, but I finished state number 50 in October and the Tetons was one of my top 5. I hope you get a chance to do it this year!! 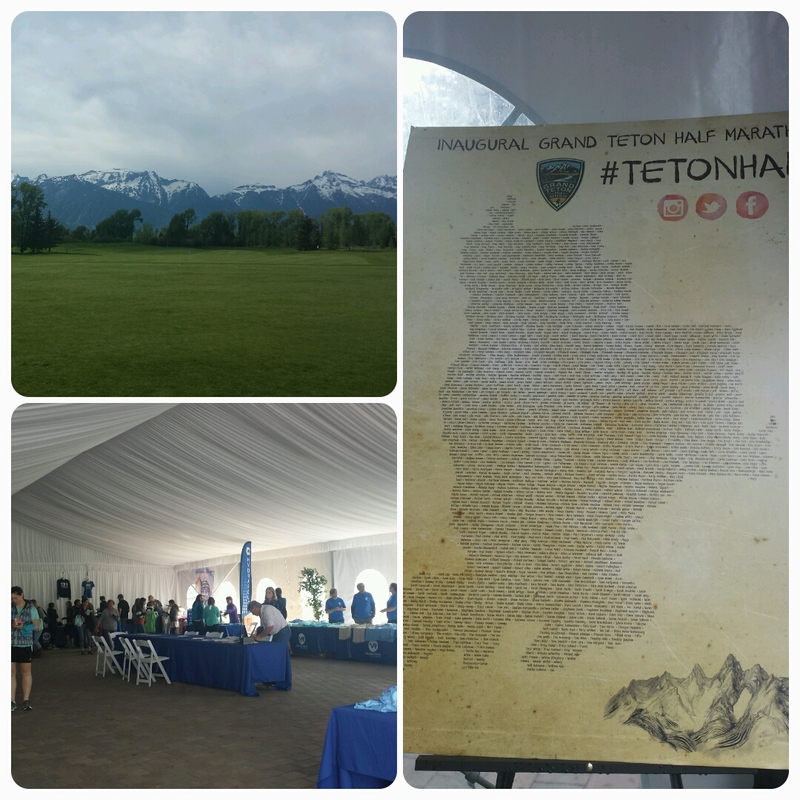 Congratulations on state number 50 and it’s good to hear that Tetons was one of your favorites! I am running it this year – can’t wait! !